Son of a poor farmer with seven children, Ignatius grew up in hard rural poverty, working the fields. At age 17, he became very ill, and promised to become a Franciscan if he was spared. When he was cured, his father convinced him to wait. At age 20 Ignatius was almost killed when he lost control of his horse; suddenly the horse stopped, and trotted on quietly. Ignatius was convinced God had saved his life again, and he decided to follow his religious vocation at once. He joined the Capuchin monastery of Saint Benedict at Buoncammino, Italy as a lay brother, taking his vows in 1722. Worked fifteen years in his house's weaving shed, then spent forty years as part of a team who went house to house asking food and donations for the friars. People soon realized they received a gift in return from Brother Ignatius as he consoled the sick and the lonely, and cheered children of the street. He made peace between enemies, converted sinners, advised people in trouble. People noticed Igantius would skip the house of a rich money-lender, a man who never forgave a debt, and who felt slighted because Ignatius passed his house. He complained to Brother Ignatius' superior, who knew nothing about the money-lender, and so sent Ignatius to the house. The saint returned with a large sack of food, but when the sack was emptied, blood dripped out. "This is the blood of the poor," Ignatius softly explained. "That is why I never ask for anything at that house." Eldest son in a pious Christian family. Matthew briefly studied at the seminary at Lai Thieu in the apostolic vicariate of Cochinchina (modern Vietnam), but being the first-born, family obligations caused him to return home. He married to a local girl, and was the father of four, two of whom were later murdered for being Christians. At one point he cheated on his wife; he repented, she forgave him, and he used the incident to re-examine his approach to his life and faith. He decided that the best thing would be become closer to the Church, to serve in his diocese, and to help the missionaries. During the persecutions of emperor Thiêu Tri in 1846, Mattheo, a skilled sailor, smuggled a group of threatened seminarians out of the county to Malaysia. The authorities suspected him of smuggling contraband into the country, and increased their surveillance of him when he was at sea. 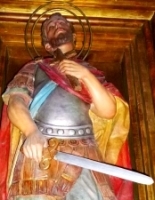 Stopped on another run in July to saved some diocesan clergy, he managed to bribe some of the soldiers, but was arrested, beaten, whipped, and ordered to desecrate a cross to prove his renunciation of Christianity. When he refused, he was imprisoned for 10 months, regularly tortured, and eventually executed for the crime of helping the missionaries. Martyr. Studied humanities and philosophy at the Jesuit college of Taranto, Italy at age 16; studied theology and canon law at the college of Gesu Vecchio. Ordained on 18 March 1666 at Naples, Italy, and served as a parish priest. Joined the Jesuits at age 28 on 1 July 1670. Rural missioner in and around Naples for 40 years. Successful and effective preacher. Ministered in prisons, brothels, and galleys. Converted Moor and Turkish prisoners of war. Rescued chidren from dangerous and degrading situations. Opened a charity pawn shop. Organized laymen into a group called Oratio della Missione to help fellow Jesuit missioners. Numerous miraculous cures were attributed to him in and after his life. His coffin was thronged by the people of Naples during his funeral procession. A few of his letters have survived, but no sermons. Born to wealthy Burgundian nobility, he became knight and courtier. Married a noble woman who proved frequently unfaithful. Ashamed of her actions, but not wishing her harm, Gengulphus became a hermit in his castle at Avallon, France, leaving his staff of servants to care for his wife. Murdered in his bed by his wife's lover. Especially admired in the Netherlands, Belgium, and the Savoy. Well-educated, and probably born to the Gallic nobility. May have been married at one point. Archbishop of Vienne, France in 461. Known for his secular and theological learning, and for bringing back the faith to an indifferent region. 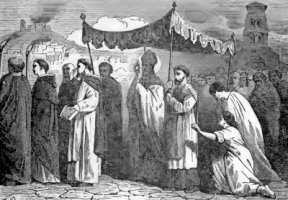 Involved in a dispute with Pope Saint Hilarius in 463 about the privileges of the diocese of Arles, France. Brought back the tradition of rogation processions which soon gained papal approval and were used throughout Europe. Built a church in honor of Saint Ferreolus whose relics were discovered in his diocese. A miracle worker, he is reported to have ended an urban disaster - through prayer he stopped a fire that was destroying the city of Vienne one Easter night. Franciscan Friar Minor. Priest, celebrating his first Mass on 30 July 1925. Vicar in Lezhë, Albania where he was arrested and tortured by Communist authorities; they tried to get him to say that his brother Franciscans gathered for political reasons and were plotting against the state. It was a lie, and Father Serafin refused to “confess” to save himself. Martyr. Augustinian monk in the monastery founded by his mother in Verucchio, Italy. 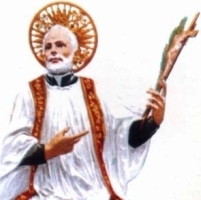 For unknown (and apparently unjust) reasons that have not come down to us, he was dismissed by the Augustinians from the Order, but was immediately taken in by the Franciscans at Monte Carnerio. Son of Illudion (Iladon, Lolladon). After inadvertently killing his father, Criotan withdrew from the world to live as a swineherd. Spiritual student of Saint Petroc. Monk. Travelled to Ireland to study with holy men in Ireland for 20 years, and then returned to Cornwall. Founded the church in Sancreed, Cornwall. Born to the French nobility. Educated by the Augustinians at Dorat, France. Joined the Augustinians in Dorat. Priest. 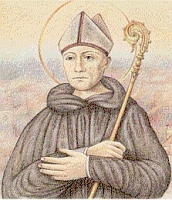 Abbot of the monastery of l'Esterp, Limousin, France where he served for 38 years. Known for love and support of his brother canons, and his charity to the poor. Son of John Rochester of Terling and Grisold of Bobbingworth. Carthusian choir monk at the London Charterhouse. Priest. Exiled by the government to the Charterhouse of Saint Michael at Hull, Yorkshire. Martyred with Blessed James Walworth for refusing to accept King Henry VIII as head of the Church. Parish priest in Rome, Italy, noted for his conversions, including that of a Roman prefect. The official's change of faith brought Anthimus to the attention of Roman officials who condemned him to drown in the Tiber for his religion. Thrown in, he was rescued by an angel. Continuing his work, Anthimus was later recaptured and martyred. Born to a wealthy imperial Roman family. Priest. 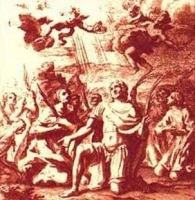 Ordered by governor Laodicio to make a sacrifice to the god Bacchus, Mozio refused; he was tortured by was not harmed by it and still refused to make the sacrifice. Martyr. Archdeacon of Macon, France. When he saw he was to be made bishop, he became a monk at Cluny Abbey. Chosen assistant abbot in 954, and then abbot in 965 much against his will. Mayeul was devoted to learning, and led his brothers by good example. Counselor to Emperor Otto I and Emperor Otto II. Otto II wanted to put him forth as papabile, but Mayeul would have none of it. Son of Lleida. Imperial Roman soldier. Martyred in the persecutions of Diocletian. Carthusian priest and choir monk at the London Charterhouse. Exiled by the government to the Charterhouse of Saint Michael at Hull, Yorkshire. Martyred with Blessed John Rochester. Member of the Missionary Oblates of Mary Immaculate. Priest. Martyr. Priest. Monk at Cluny Abbey in France, taking the cowl partly to avoid becoming a bishop. 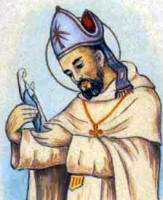 Abbot of Cluny. Advisor to popes and emperors. Spiritual student of Saint Brioc. Monk, hermit and missionary in Brittany. Abbot at Landevennec, Brittany. Founded monasteries. Missionary to Cornwall. Franciscan tertiary. A close friend of Blessed Bartholomew Buonpedoni, he tended to Bartholomew and assisted in his twenty-year ministry to lepers. Imperial advisor to emperor Nero. Converted to Christianity after witnessing the courage and faith of martyrs. He left the imperial court and fled Rome, but was captured and executed. Martyr. Born to the nobility. Married to Saint Bertilia of Thuringia. Father of Saint Waltrude and Saint Aldegundis. Benedictine monk at San Mariano Abbey, San Severino, Marches of Ancona, Italy. Magistrate in Verdun, France. Bishop of Verdun in 470. Led his diocese during a period of constant invasion by and trouble with Franks, Vandals and Goths. Hermit. Martyred by pagan Danish invaders. Franciscan monk; spiritual student of Saint Francis of Assisi. Nun in Rome, Italy. Spiritual student of Saint Marcella. Born to the early 7th century Frankish nobility. Married to Saint Bertilla. Born to the early 7th century Frankish nobility. Married to Saint Gualberto. An imperial Roman official, his wife, their children and servants, all of whom were converts and martyrs: Anastasius, Aradius, Callisto, Eufemia, Evodius, Felice, Primitiva, Theopista.